Being a Curofy Campus Ambassador has its own perks. We are given new, exciting, beguiling and unconventional tasks every month. This time, we were tasked with interviewing a doctor on a pre-tested set of questions. I chose to interview Dr. Jagdish Chaturvedi, who was visiting our college on my invitation for the Hackathon event at Manipal Conventus. It was surely an off-center task for me, although I enjoyed every bit of it. 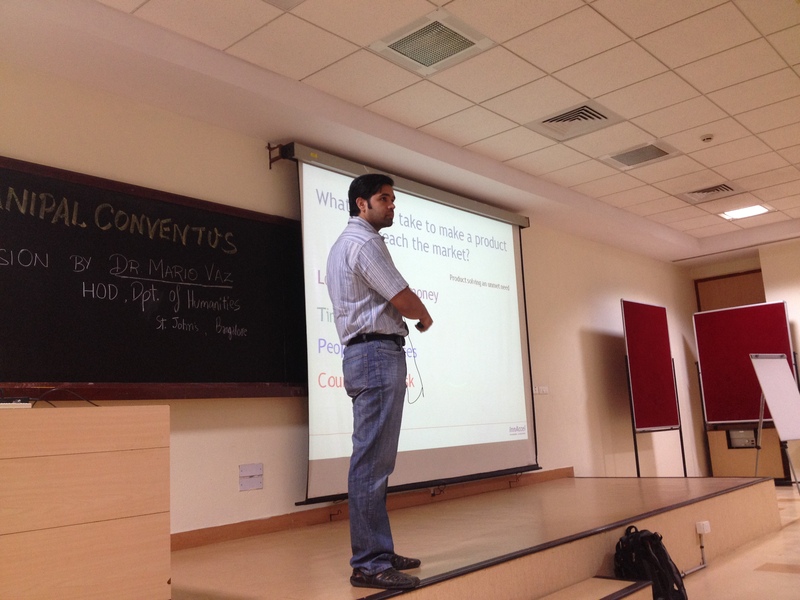 Dr. Jagdish Chaturvedi giving a short talk on the basics and methodology of a hackathon. Dr. Jagdish Chaturvedi is an ENT surgeon trained at St. John’s Medical College and Hospitals and is currently working at Apollo Hospitals, Bangalore as well as runs his own private clinic alongside. He is also a Stanford-India Biodesign Fellow (SIB) Fellow, 2012, only doctor from India in 2012 and has an MBA in Entrepreneurship and Hospital Managemnet (NIBM, 2013). He has also co-invented and developed 18 affordable medical devices since 2010. He is also Director, Clinical Innovations at Innaccel Acceleration Services Pvt. Ltd.
Do you think there is a lack of communication among doctors at present? Yes, there is definitely a lack of communication, especially in the private sector. At least in the medical colleges and government hospitals there are teaching sessions and group discussions that happen but for a private, individually practicing doctor, there is absolutely no way to connect to other doctors of their own fraternity and also no cross-disciplinary discussion at all. If yes, what are the factors responsible? I think, people have different schedules and different patient loads and also different practicing profiles. Sometimes, there is also inter-departmental rivalry involved, especially in a surgical field. I can say from an ENT surgeon’s point of view that I am a threat to neurosurgeon, a general surgeon doing thyroid surgery and also an ophthalmologist. Also, there is no natural transition to interact. At the most, I interact with a pathologist and a radiologist related to biopsy samples and scans respectively but I don’t interact with other surgeons. How as a physician/surgeon, you can use an exclusive networking app for doctors, like Curofy? One way is to get some data, it’s very easy to connect to other doctors who are working in the same group or field. For example, for chronic rhinosinusitis, how many patients do they see, how many face surgeries do they do. Another is, to also get in touch with latest things that are happening and sometimes from a senior doctor, it’s always good to get a second opinion because they have the expertise and you may not be easily accessible to them. So, if you have a difficult case and you want them to review your case and get their opinion on what they should do, this could be a good platform to use that. What are the present means you use to contact other doctors or your colleagues? Right now, the direct means are through my friends and colleagues that I directly have. Some of them are my MBBS batch mates, some are orthopedist, some are pediatrician. That is the way I keep in touch. The other way is at the hospital where I work, I make friendly relationship with other teams and I directly reach out to them. Apart from this, if I go to any conference I can meet my fellow practitioners. But even then, I am an ENT surgeon and if I want to meet a cardiologist, I’ll have to go to a cardiology conference or attend a convention. Apart from that, I have no other way. Do you think these ways fulfill your networking needs? They don’t fulfill the one aspect where Curofy can help connect me with people who are otherwise not their on my contact list. Whereas otherwise, I am satisfied with the people I already know and I maintain these connections. If I want to connect with a new group of people, a new team of doctors or specialists, currently I don’t have a way to do that. What are the challenges you face in keeping up-to-date with latest information? These challenges can be: where to look for data, lack of data and where to basically find latest information. So, right now I have to go and search various portals, Facebook pages, groups or look at notice boards or wait for a friend to Whatsapp or email me a new update. But there is no place where all the collected information comes to me on my phone like a TOI app that tells me all the news. As a med-tech innovator yourself, what are the modifications or new introductions that you would suggest in the app to make it even better? Well, I can’t think of anything at the top of my head right now but I would think, anything that can enhance the second opinion interface to contact senior doctors or to ensure that there is a way to get their contact details to call them or Skype with them, then that would be a good way. Right now, I can’t think of anything else but if I think of something, I would definitely love to share.